Steppin' In It delivers old-time country swing and blues and originals from singer/songwriter Josh Davis. When singer Rachael Davis steps on stage, the ensemble becomes Shout Sister Shout, bringing the charm of swing-era classics to a new generation. Featuring selections from Steppin' In It's latest CD, Simple Tunes for Troubled Times and much more. Songs featured from Steppin' In It include: The Ghost of Richard Manuel, The Break of Day, Good Bye Betsie Brown, Hittin' on All Six, Mr. President, Give My Regards to Miss Moline and Hit That Jive Jack. Shout Sister Shout performs: It's a Sin to Tell a Lie, Don't Let the Sun Catch You Crying, Wren's Lullaby and I'll Be Glad When You're Dead. As a solo artist, Rachael Davis performs Johnny's Song. 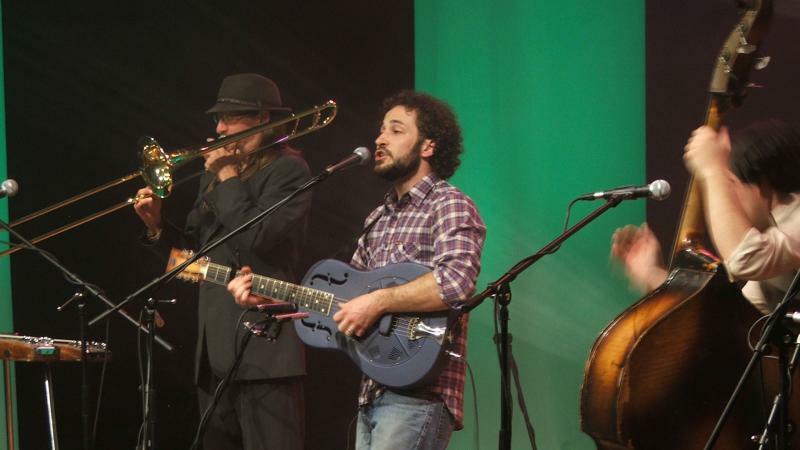 The musicians of Steppin' In It are: Joshua Davis (guitar and vocals), Dominic Suchyta (bass and vocals), Andy Wilson (harmonica, horns and vocals), Joe Wilson (pedal steel guitar and vocals). Shout Sister Shout is all of the above, plus vocalist Rachael Davis.